PROFIBUS is the worldwide standard when it comes to networks in industrial automation. With a majority share of the fieldbus market, it has grown to become the unequivocal leader in this industry. Via a single cable, PROFIBUS links controllers or control systems with decentralized field devices (sensors and actuators) on the field level and also enables consistent data exchange with higher ranking communication systems. The consistency of PROFIBUS is enabled by utilizing a single, standardized, application-independent communication protocol which supports fieldbus solutions both in factory and process automation as well as in motion control and safety-related tasks. Part of the value proposition of PROFIBUS is its ability to cut costs and improve operations across the life-cycle of a plant, from design right through ongoing maintenance and even revamps. It does this in many ways: at the engineering stage it simplifies plant design, eliminates hard wiring and requires less hardware, leading to faster commissioning and lowered costs. It supports better diagnostics, making commissioning much faster. PROFIBUS also helps achieve better productivity and higher product quality through the delivery of better and more timely data to operations and management staff. In addition, it supports advanced asset management strategies for general management and maintenance. A huge number of vendor companies have developed PROFIBUS capable devices for discrete and process automation, therefore system integrators have many choices. This multi-vendor environment has lead to security and flexibility of supply. It also encourages healthy competition amongst vendors, leading to favorable pricing to end users. The success of PROFIBUS is underpinned by the global technical and administrative network of PI, which has carefully guided its development to ensure end-users’ needs continue to be met. The applications coverage has been continuously extended to include new and relevant functionality(ie. integrated Functional Safety and motion control). Users have made substantial investments in training, tools, inventories, and plants. In short, the value proposition of PROFIBUS has become commandingly high. That’s why PROFIBUS is the most successful fieldbus in history. Stepping from analog to digital communication means a major paradigm shift. In control systems that do not rely on a fieldbus, there is a clear divide between the devices and the controls; the tasks of each are separated. Only analog values (measured data) are transferred between devices and controllers, and this communication is one-way. From a personnel perspective, this typically meant that an instrumentation technologist was responsible for the field devices, and a control engineer scales the (4-20mA) analog values coming into the control system accordingly. In a fieldbus system, the instruments are an integral part of the system, and the control engineer has full control over field devices. From the engineer’s point of view, there is now no distinction between the instruments and the control system. It is an integrated whole. Having the instruments as part of the control system is a major paradigm shift as it gives the instrument a role that in the past had been reserved for the control system. Conversely, the instrument technologist needs access to the control system for set up and monitoring of the instruments. The communication is no longer analog, but digital; no longer one-way, but two-way. And with this shift, we now have a network, and different topologies are possible. Plant Asset Management – Information from process instruments and sensors and actuators are available in the controller. Engineering and Documentation – Engineering is simpler, and the documentation is far less complicated as hundreds of separate wires are reduced to just a single cable. Installation – With less hardware, installation is easier and faster. Commissioning – Devices can sequentially be brought online, one by one, with start-up initiated from a central location. Process Variables – The diagnostic information and status bytes available tell the user if they can trust the process variable or not. Manufacturing Flexibility – As demand shifts, changes in manufacturing can be implemented rapidly. Maintenance and Operations – With the powerful diagnostics of a fieldbus come improved availability and reduced downtime. 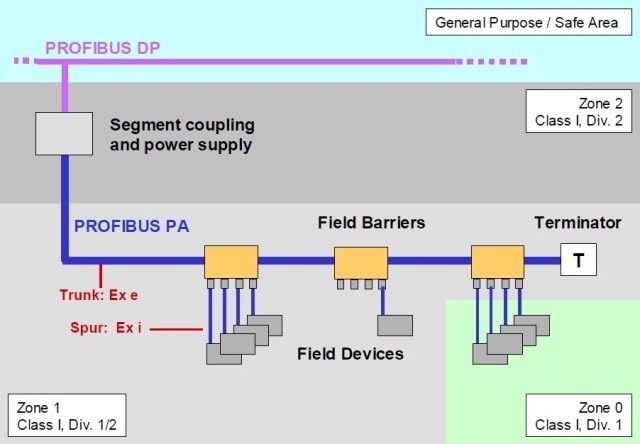 Learn more about fieldbuses and their value with this white paper: Why use a Fieldbus? Discrete -or Factory Automation- is typically characterized by faster processes than process applications. Here we use PROFIBUS DP (Decentralized Periphery). The most prevalent medium for PROFIBUS transmission is over copper wire, and for this, the easy-to-use and cost-effective RS-485 transmission technology is used. We are able to transport 244 bytes of data from 9600 bit/s up to 12 Mbit/s. This range of speeds can accommodate nearly every application. There are some instances under which wired transmission technology reaches its limits, for example in an environment with heavy interference or when bridging long distances. In these cases, optical transmission via fiber cables is available. The communication basis for PROFIBUS lies in the cyclic data exchange between PLCs (masters) and devices (slaves). A cycle will consist of a master sending outputs to, and receiving inputs from all of it’s devices, and then repeating the cycle. This also includes device-, module-, and channel-specific diagnostics (e.g. wire break, short circuit, etc.) for quick fault localization. All field devices have the same priority, and every device is scanned every cycle. “DP-V0” is the base protocol for cyclic I/O and diagnostics. This is further extended in “DP-V1” which allows for the acyclic exchange of data between PCs or PLCs and slave devices. This also includes the on-demand access of device parameters, and the setting of alarm limits. Finally, the “DP-V2” extension provides the capability for slave-to-slave communication in a broadcast Publisher/Subscriber fashion. DP-V2 applications include motion control and other high-speed requirements. Process Automation environments, while typically requiring slower procedures, might also be characterized by explosive or hazardous environments. In such applications, we use PROFIBUS PA as opposed to PROFIBUS DP. Similarly, we can use copper wiring or fiber-optic cabling. In the case of the former, instead of RS-485, the physical layer is MBP (Manchester Encoded Bus Powered). It is important to note that even though a different physical layer is employed, PROFIBUS PA is the exact same protocol as PROFIBUS DP. MBP only transmits at one speed: 31.25 kbit/s, which is plenty for process applications. A significant departure, however, is that power and data are transported via the same cable. As such there are rules regarding network topology that must be followed. The FISCO (Fieldbus Intrinsically Safe COncept) model makes it easy to plan, install and expand PROFIBUS PA networks. This model is based on the specification that a communication network is intrinsically safe and does not require complex calculations for validating intrinsic safety if the relevant components (field devices, cables, segment couplers, and bus terminations) conform to a set of limit values for voltage/current/output/inductivity/capacitance. Intrinsic safety is guaranteed on a network segment if all components are certified as per FISCO. It is characterized, however, by a considerably low input power into a segment and therefore shorter cable lengths and fewer devices per segment. The High-Power Trunk concept relies on the separation in the different zones of explosive and hazardous environments. In less stringent hazardous zones (where only increased safety is required), a trunk cable is laid. It is assumed no ‘hot’ maintenance will be required on the trunk line. Off of this (‘spurs’), field devices are connected that lie in areas where intrinsic safety is required. Proof of intrinsic safety therefore only involves the field barrier and the device(s). This ‘Trunk and Spur’ concept is very popular as it leverages the topology options available with MBP physics. Media Redundancy – A ring topology is formed, then if one segment is broken the topology is automatically converted to a line configuration. Both – Often times both methods are employed; for example, a dual-master ring network. PROFIBUS Application Profiles are vendor-independent specifications implemented into PROFIBUS devices to enable the uniform behavior of devices from different manufacturers. The basic functions and services of the nodes must match to ensure smooth interaction between the bus nodes. They have to “speak the same language” and use the same concepts and data formats. This applies both for communication and for device functions and industry sector solutions. This uniformity is achieved through the use of “profiles” relating to device families or special industry sector solutions. These profiles specify features which “profile devices” must exhibit as a mandatory requirement. These can be cross-device-class features, such as safety-relevant behavior (Common Application Profiles) or device-class-specific features (Specific Application Profiles). Application Profiles are specified and maintained by PI Working Groups.